To a large extent, what we do and the circumstances we find ourselves in are beyond our control. [i]Yet this fact presents a problem for the common view that we can be held responsible only for what we have direct control over. If we have control over very little, if anything at all, then to what extent can we be held responsible? A typical response by feminist philosophers is to accept the absence of control—or in other words, the presence of luck—but to insist that responsibility remains often enough. According to this view, where there is luck, there can also be responsibility (what we call, “luck with responsibility”). At the same time, feminists accept, of course, that where there is luck, there may not be responsibility (see “luck without responsibility”). In general, like other philosophers, feminists have a complicated understanding of the relationship between luck and responsibility. 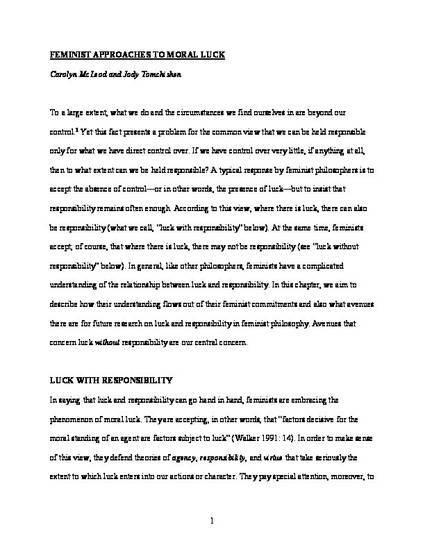 In this chapter, we aim to describe how their understanding flows out of their feminist commitments and also what avenues there are for future research on luck and responsibility in feminist philosophy. Avenues that concern luck without responsibility are our central concern.